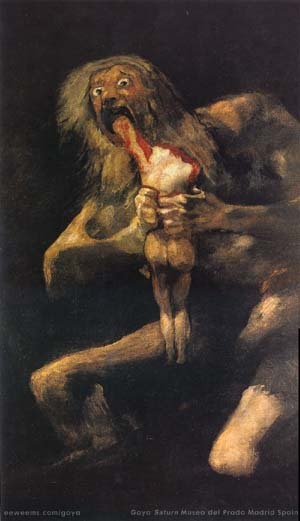 Though this painting is called "Saturn" and seems rooted in showing the mythological character that devoured his son, there are, like many of the other 'Black Paintings' a certain disconnection between any strict understanding of the ancient tale versus Goya's depiction of it. While the other famous rendition of the story by Peter Paul Rubens (image below) carefully illustrates the story in detail, with this picture by Goya there is variation and improvisation. Rubens's picture shows Saturn in his jealousy and fear destroying his progeny, a more or less reasonable action within the confines of mythological tales. The gods take dramatic action, deeds that on a purely human scale are absurd, but in that hyper-dramatic genre make sense. In Goya's image, though, there is no context of legend, but instead a stripped-down scene of cannibalistic horror. 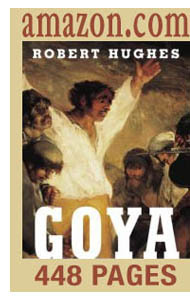 What is Goya's improvisation on this familiar icon of art and literature? For one, he renders it blatantly insane, Saturn shown without any recognizable expression of premeditation. Another is no context given of the ethical system of mythology. What system could explain this picture? Apostle Paul said that the heathen do not worship gods, but demons masquerading. Has Goya stripped away all the academic and literary cloakings for Saturn and thrown out this portrait as a simple bit of Christian dogma, however dark and crazed? From a reader: This is one of my favorite paintings because it was done purely as an expression from the artist and was never intended to be seen by anyone but Goya. You can almost feel the painter's bitterness and anger over the civil strife that was going on in his country at the time and the bleak outlook on humanity that he had. You can picture him covering up the pleasant scenes that were already on the walls with black paint, turning an idyllic mountain landscape into a dark and foreboding image. As much as I enjoy the painting, I do feel a bit of sympathy for the live-in housekeeper. 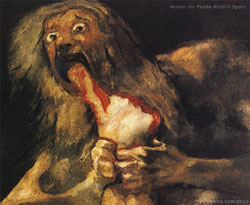 Saturn Devouring His Son is one of 14 "Black Paintings" Goya did on the walls of his house. This one resided in the dining room along with 5 others. Imagine sitting down to dinner across from this! The dread and uneasiness one must have felt in the house would probably be similar to the feeling one has when they have a meeting with a Houston DWI attorney coming up. 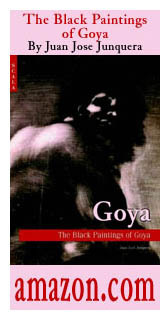 If anyone is interested in learning more about Goya during the "Black Paintings" time period or would like to see the other works, the Wikipedia entry is an excellent resource. 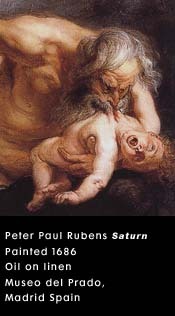 Rubens's Saturn, is outwardly more refined than Goya's, but remains the more horrific of the two. 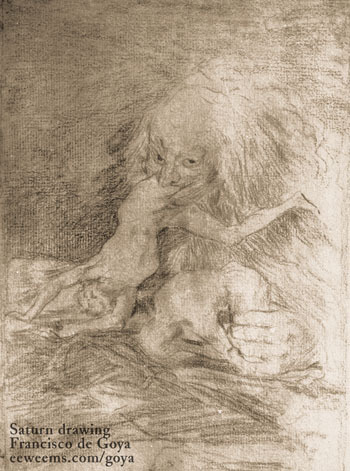 The viewer's sympathy is directed toward the baby, yet to be eaten, and Saturn appears a cruel, and corrupt power. Afraid of losing his great strength, he seems remorseless, unaware of the figure of death behind him. Patricia Wright, from her book Eyewitness Art: Goya, published by DK books 1993, pag 51.